Organized brain cutting procedures are necessary to correlate specific neuropsychiatric phenomena with definitive neuropathologic diagnoses. Brain cuttings are performed differently based on various clinico-academic contingencies. This protocol describes a symmetric bihemispheric brain cutting procedure to investigate hemispheric differences in human brain pathologies and to maximize current and future biomolecular/neuroimaging techniques. 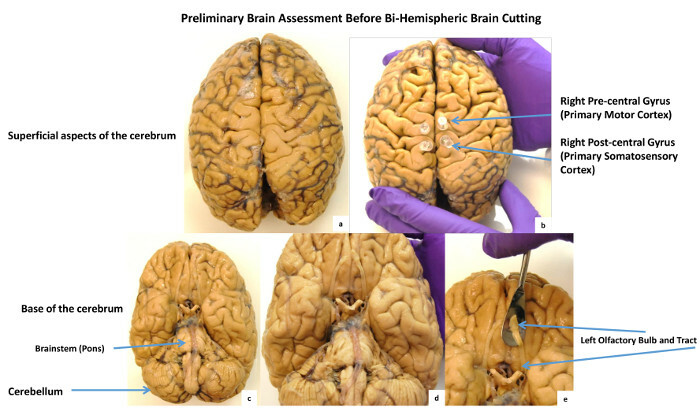 Iacono, D., Geraci-Erck, M., Peng, H., Bouffard, J. P. Symmetric Bihemispheric Postmortem Brain Cutting to Study Healthy and Pathological Brain Conditions in Humans. J. Vis. Exp. (118), e54602, doi:10.3791/54602 (2016). Neuropathologists, at times, feel intimidated by the amount of knowledge needed to generate definitive diagnoses for complex neuropsychiatric phenomena described in those patients for whom a brain autopsy has been requested. Although the advancements of biomedical sciences and neuroimaging have revolutionized the neuropsychiatric field, they have also generated the misleading idea that brain autopsies have only a confirmatory value. This false idea created a drastic reduction of autopsy rates and, consequently, a reduced possibility to perform more detailed and extensive neuropathological investigations, which are necessary to comprehend numerous normal and pathological aspects yet unknown of the human brain. The traditional inferential method of correlation between observed neuropsychiatric phenomena and corresponding localization/characterization of their possible neurohistological correlates continues to have an undeniable value. In the context of neuropsychiatric diseases, the traditional clinicopathological method is still the best possible methodology (and often the only available) to link unique neuropsychiatric features to their corresponding neuropathological substrates, since it relies specifically upon the direct physical assessment of brain tissues. The assessment of postmortem brains is based on brain cutting procedures that vary across different neuropathology centers. Brain cuttings are performed in a relatively extensive and systematic way based on the various clinical and academic contingencies present in each institution. A more anatomically inclusive and symmetric bi-hemispheric brain cutting methodology should at least be used for research purposes in human neuropathology to coherently investigate, in depth, normal and pathological conditions with the peculiarities of the human brain (i.e., hemispheric specialization and lateralization for specific functions). Such a method would provide a more comprehensive collection of neuropathologically well-characterized brains available for current and future biotechnological and neuroimaging techniques. We describe a symmetric bi-hemispheric brain cutting procedure for the investigation of hemispheric differences in human brain pathologies and for use with current as well as future biomolecular/neuroimaging techniques. Neuropathologists have the scientific privilege, intellectual honor, and diagnostic obligation to assess human brains. For many decades, detailed clinical descriptions of brain diseases and major efforts to individuate their possible neurohistological correlates in human postmortem brains have been undertaken. Historically, those efforts represented the most productive modality by which the medical sciences, and neurology in particular, advanced in the modern era. Thanks to previous eminent neuropathologists and their dedication, determination, scholarship, and astonishing capacity to discriminate between normal and abnormal brain tissues (often using very rudimental tools), we can now investigate and target diseases such as Alzheimer-Perusini's disease (unfairly only called Alzheimer's disease; APD/AD)1, Parkinson's disease (PD)2, Creutzfeldt-Jakob disease (CJD)3, Lou-Gehrig's disease/Amyotrophic Lateral Sclerosis (ALS)4, and Guam disease5, to mention a few. Advanced techniques of neuroimaging, such as high-definition computerized tomography (i.e., multisection spiral CT scan; CT angiography), functional and morphological magnetic resonance imaging (i.e., fMRI, diffusion-MRI, tractography-MRI, etc. ), Positron Emission Tomography (PET), ultrasound-based imaging, and others, have certainly modified our general approach on how to diagnose and cure neurological and psychiatric patients. Nonetheless, although neuroimaging techniques are capable of visualizing a person's brain when alive, they do not offer the opportunity, at the occurring moment, to directly analyze the highly intricate cellular and subcellular structures of cells, such as neurons; or to visualize, mark, and quantify specific types of intracellular lesions; or to precisely indicate their neuroanatomical or subregional localization at circuital and sub-circuital anatomical levels. For example, neuroimaging techniques cannot identify or localize Lewy Bodies (LB) in pigmented neurons of the Substantia Nigra (SN), a common pathologic feature associated with PD, or neurofibrillary tangles (NFT) in the entorhinal cortex, a classical feature of AD and other brain pathologies. Neuropathological investigations combined with advanced digital microscopy are still unreplaceable for detailed clinicopathological correlations and, thus, for definitive diagnoses. Due to the peculiar anatomo-functional properties of the human brain, and especially to its anatomical localization (that is, inside the skull, a natural protective system that does not allow the direct examination of its content), the introduction of in vivo neuroimaging techniques have extraordinarily helped clinicians and investigators to find initial answers to some of the mysteries of this complex tissue. However, there is no clinical or neuroimaging methodology that can replace the unique opportunity to directly analyze brain tissue during an autopsy. Only the organized collection, preservation, and categorization of human brains can allow direct and systematic investigations of neuronal and non-neuronal cells, their subcellular constituents, intracellular and extracellular pathological lesions, and any type of abnormality inside the brain to confirm, modify, or redefine clinical diagnoses and to discover new clinicopathological correlations. One of the apparent limitations concerning the assessment of the brain at autopsy has been the fact that this procedure is a cross-sectional methodology. There will always be a delay between an ongoing neuropathological process (clinically manifested or not) and the chance, if any, to define it at the neurohistological level. This is mainly due to the incapacity of the human brain to regenerate itself. It is not currently possible to obtain brain tissue in vivo without creating permanent damage. Consequently, it is not possible to longitudinally and neuropathologically assess the same brain/person. However, standardized brain banking procedures and an increased awareness for brain donation among the general public could greatly contribute to the resolution of brain-autopsy timing issues by consistently increasing the number of cases to collect and analyze. In this manner, more adequate numbers of postmortem brains could be obtained to define constant patterns of pathological origin and progression for each specific type of brain lesion associated with each human brain disease. This would require donation and collection of as many brains as possible from patients affected by any neuropsychiatric disorder, as well as from healthy control subjects across all ages. One possible method could be collecting as many postmortem brains as possible from general and specialized medical centers as a standard routine. The need for brain donations has been recently expressed by those who study dementia and normal aging6. The same necessity should be expressed by the neuropsychiatric field as whole. For the abovementioned and for other reasons, an update of ongoing brain cutting procedures is necessary. Moreover, brain cutting procedures should be universally standardized across different neuropathology research centers around the world, also taking in account the possibility to employ current and future biotechnological techniques to better investigate and, hopefully, to definitively understand, the causes and mechanisms of brain diseases in humans. Here, mainly for research purposes, we describe a symmetric methodology for postmortem brain cutting in humans. This procedure proposes collecting more cerebral regions than normally done and from both cerebral and cerebellar hemispheres. A symmetric bi-hemispheric brain cutting procedure will fit much better with our current knowledge of human neuroanatomy, neurochemistry, and neurophysiology. This method also allows the possibility to neuropathologically analyze the unique features of the human brain, such as hemispheric specialization and lateralization that are associated with higher cognitive and non-cognitive functions typically or exclusively present in our species. Whether there are specific pathogenetic relationships between hemispheric specialization/lateralization and specific types of brain lesions, or whether a peculiar neuropsychiatric pathogenetic event is initially, prevalently, or exclusively associated with a specific hemisphere and function is not currently known. By describing this symmetric brain cutting procedure, we aim to propose an updated method of human brain dissection that could help to better understand normal and pathological conditions in a highly specialized tissue, the brain. This method also takes into consideration those morpho-functional hemispheric aspects that exist only in humans. Procedures involving postmortem human tissues have been reviewed by the institutional review board and exempted under 45 CFR (Code of Federal Regulations). NOTE: The protocol describes a symmetric bihemispheric brain cutting procedure for postmortem brain assessment finalized for neuropathological studies in humans. Detailed descriptions of the apparatuses, instruments, materials, and supplies necessary to perform human brain cutting will be excluded. Materials and supplies for brain dissections are selected at the discretion of the single investigator and are based on autopsy tools allowed or approved at each research institution. The minimal set of tools and material required for this procedure is described in the Material/Equipment Table. Specific cutting procedures and precautions for suspected transmissible brain diseases, such as human CJD, are outside the aims of this manuscript and are available from other sources7. Note: Ensure that the brain has received the necessary tissue fixation (using, for example, neutral-buffered 10% formalin) for a period of two to three weeks, depending on the periagonal, metabolic (i.e., pH), and tissue preservation (i.e., temperature) conditions. However, for imaging-pathology correlation studies, a longer period of fixation (>5.4 weeks) has been suggested8. Place the brain on a flat surface facing the investigator, with the frontal poles directed in the opposite direction with respect to the investigator. Place the brain in such a way as to allowing a full and clear visualization of all cortical gyri and sulci of the entire cerebrum (Figure 1a). First look for meningeal anomalies, macroscopic hemispheric asymmetries (possible indicators of focal, lobar, or generalized hemispheric phenomena of atrophy), macroscopic tissutal lesions (i.e., tumors or herniation), congenital malformations, vessel abnormalities, and any other possible abnormalities or unusual presentations of the cerebral surface. ​NOTE: For detailed descriptions on how to assess a human brain, refer to commercially available neuropathology textbooks and autopsy manuals9,10. Face frontal poles away from the investigator, with the superficial aspects of the hemispheres (telencephalon) facing the investigator. Take as many digital pictures as necessary in each particular case to document possible macro-anomalies and to account for possible clinico-neuroanatomical and post-cutting considerations. Have a research assistant take digital photographs perpendicularly to the brain to capture the entire cortical surface (Figure 1a - c). Mark pre and postcentral cortical gyri using ink or colored needles before cutting the brain (Figure 1b). NOTE: This procedure facilitates a more immediate recognition of the motor and somatosensory primary cortices after cutting. Rotate the brain by 180 degrees while keeping it facing the same direction (i.e., the frontal poles facing away from the investigator). Carefully inspect the base of the brain. Pay special attention to the conditions of cerebrovascular systems (i.e., basilar and vertebral arteries and the circle of Willis) and cranial nerves at their brainstem exit/entrance levels. Manage the olfactory bulbs and tracts with special care to avoid tissutal laceration, due to their extreme frailty. Take as many digital pictures as necessary in each particular case to document possible macro-anomalies and to account for possible clinico-neuroanatomical and post-cutting considerations. Have a research assistant take digital photographs perpendicularly to the brain to capture the entirety of the cortical and brainstem surfaces. Facing the base of the brain and using a scalpel, cut the brainstem transversally at the level of the upper portion of the pons (as close as possible to the base of cerebrum). Carefully inspect the SN (i.e., for pallor)11 and other neighboring structures12. Take note, possibly using an audio recorder device, of any unusual appearance of the brain in comparison to a normal brain13. Again rotate the brain by 180 degrees and, using a sharp knife, separate the two hemispheres by cutting the corpus callosum centrally through the medial longitudinal fissure and following a fronto-occipital direction. Inspect each side of each hemisphere for possible anomalies (e.g., ventricular enlargements, malformations, tissue softening, tumors, etc.)13. See Figure 2a. Take as many digital pictures as necessary in each particular case to document possible macro-anomalies and to account for possible clinico-neuroanatomical and post-cutting considerations. Have a research assistant take digital photographs perpendicularly to the brain to capture the entire cortical surface. Take note of any unusual feature of the brain in comparison to a normal brain. Place the two hemispheres flat, lying on their medial aspects, with the frontal lobes facing away from the investigator, as shown in Figure 2b. Place them in such a way that their centers touch (also in case of marked hemispheric asymmetry). Using a sharp knife, manually cut through both cerebral hemispheres, starting at the frontal poles and moving towards the occipital poles through the entire length of the hemispheres. Obtain two series of 1 cm thick blocks of brain tissue (around 18 slabs for each hemisphere). Place the brain slabs in an anatomically organized (fronto-occipital direction) sequence on a separate flat surface. Use a white surface with a ruler printed on it for better contrast when photographing. Display the two series of cerebral slabs in an anatomically symmetric way (fronto-occipital direction), making sure that their coronal surfaces are visible for direct eye inspection and digital photography (Figure 3a). Use cutting surfaces with printed millimetric grids on both sides to localize brain structures, sizes, and possible abnormalities in a more accurate manner. Take as many digital pictures as necessary in each particular case to document possible macro-anomalies and to account for possible clinico-neuroanatomical and post-cutting considerations. Have a research assistant take digital photographs perpendicularly to the brain to capture the entire cortical surface. Take notes (possibly using an audio recorder device), of any unusual aspect of the brain in comparison to a normal brain. Using a sharp scalpel, manually dissect smaller rectangular blocks of brain tissue for each established cerebral region. Follow the proposed cerebral region collection scheme described in Table 1. Put each tissue block in separately labeled histocassettes. ​NOTE: Each block of brain tissue needs to be cut to fit, as much as possible, the standard histocassette maximal volume (30 x 20 x 4 mm3). Label the histocassettes using a de-identifying code for each case and using specific neuroanatomical identifiers (do not use random letters or numbers for different brains; rather, always use the same regional anatomical names or corresponding numbers, as shown in Table 1). Create de-identifying codes, for example, by generating random or semi-random numbers for each case (i.e., BRC 130, where B stays for Brain, R stays for Resource, C stays for Center and 130 is a progressive accession or AD160001, where AD stands for "Alzheimer's disease study," 16 is the year when the autopsy was performed (2016), and 0001 a progressive accession specimen number). ​NOTE: This step is very helpful for future researchers; keep a legend, and specify the hemisphere (L = left hemisphere, R = right hemisphere). Use two different colors of histocassettes, establishing a specific color for each hemisphere. Take as many digital pictures as necessary in each particular case to document possible macroanomalies and to account for possible clinico-neuroanatomical and post-cutting considerations. Have a research assistant take digital photographs perpendicularly to the brain to capture the entire cortical surface. Take note of any unusual feature of the brain in comparison to a normal brain. Take digital pictures (as many as necessary or desired) of the entire cut brain and the associated histocassettes. Punch (e.g., by Accu-punch) small pieces of tissue for DNA extraction and genetic analyses. Use a punch of 2 - 5 mm in diameter. NOTE: For its high content of genomic material, the cerebellum is the preferred choice; however, any other region is fine. Re-immerse all histocassettes containing brain tissue blocks in the same type of fixative solution (e.g., 10% neutral-buffered formalin) as previously used until the next step of tissue processing. Follow standard procedures for human formalin-fixed tissue processing14. NOTE: The symmetric bihemispheric brain cutting protocol described in section 2 offers the possibility of cutting tissue slabs from unfixed, fresh brains (when available) in the same systematic and symmetric manner. Place the entire fresh brain upside down (preferably on a semispherical bowl-like plastic surface) for 8 - 10 min in a -80 °C freezer to harden the brain tissue without provoking biochemical damage and to facilitate the manual cutting. Using a sharp knife, cut both hemispheres in an alternate and consecutive manner, following the brain cutting protocol described in Section 2, but freeze and fix every other slab (from both hemispheres and along a fronto-occipital anatomical direction). At this point, do not try to cut each cerebral region, as described in Table 1. Cut specific fresh brain regions only if required for immediate RNA or protein extraction (i.e., for genomic or proteomic studies)15. After cutting, immediately freeze, label, and number each fresh tissue. Take digital pictures of the entire slab series; pack each slab in a single plastic bag; collect the slabs in a separate, one-brain-only container; and store the container in a dedicated -80 °C freezer. ​NOTE: The freezer should be dedicated to human brain tissue only. Only later will single frozen brain regions be cut as required for each specific experiment. Immerse every other tissue slab chosen for fixation (10% neutral-buffered formalin or another fixative) in separate bags containing a sufficient volume of fixative (3/1 volume of fixative/tissue-block ratio). Label each bag by consecutively numbering them following a fronto-occipital sequence. Seal each bag, take digital pictures, and store them in a plastic container. Open the fixative-containing bags after 2 weeks of tissue fixation and cut each cerebral region as described in Table 1. NOTE: The set of cerebral regions cut based on the proposed scheme (Table 1) are sufficient to satisfy most, if not all, currently established consensus-based pathological criteria for AD16, PD17, Dementia with Lewy Bodies (DLB)18, Frontotemporal Dementia (FTD/MND)19, Progressive Suprabulbar Palsy (PSP)20, Multiple System Atrophy (MSA)21, Chronic Traumatic Encephalopathy (CTE)22, etc. For each brain region and for both hemispheres, perform the following minimum set of histostains: Hematoxylin and Eosin (H&E), cresyl violet (CV; if quantitative morphometric studies are planned, for example), and silver staining (if "exploratory" analyses are needed). For each brain region and for both hemispheres, perform the following minimum set of immunohistochemistry protocols: β-amyloid (βA), phosphorylated-Tau (pTau), phosphorylated α-synuclein (pα-syn), and phosphorylated-TDP43 (pTDP43), as described14. NOTE: The total number of tissue sections in order to assess each brain following this protocol is 46 (if all cerebral regions from both hemispheres are available). The time spent for a single symmetric bihemispheric fixed brain cutting procedure is estimated at 1 h (excluding the time spent setting up the dissection table, tools, and cutting surfaces; labeling; etc.). The time required for a single symmetric bi-hemispheric alternating frozen and fixed brain cutting procedure is estimated to take 2 h. It can take at least between 4 - 6 weeks to obtain definitive histological diagnoses for a single human brain/subject. After postmortem brain removal from the skull, an appropriate period of tissue fixation (2 - 3 weeks at least) must occur. Then, a series of protocols, including the symmetric bihemispheric brain cutting, tissue processing, tissue embedding, block sectioning, and staining and immunohistochemistry must be carried out. Finally, the microscopic assessment of each region per hemisphere, the use of consensus-established pathology criteria and classifications, the review of clinical records, and possibly the correlation of clinicopathology, must take place before neuropathological conclusions. The entire timing for a complete human brain neuropathological assessment should be carefully considered when planning for specific research studies. Furthermore, medical colleagues and research investigators, donors' families, and legal authorities should be informed of the total time requirement, complexity, and team time/effort to obtain a modern neuropathological assessment. Although the proposed brain cutting protocol represents a time-consuming and challenging procedure, it actually represents a scientifically rewarding methodology to extensively assess human brains in both healthy and pathological conditions. It is important to emphasize that, quite often during autopsy, brains received as control/normal subjects (i.e., subjects assessed as clinically or neurologically normal prior to death) may actually be found to be positive for various brain pathologies after an accurate neuropathological assessment. These cases represent the so-called asymptomatic and preclinical subjects for various brain diseases, especially those characterizing age-related neurodegenerative diseases. This underlines the importance of assessing brains received as "control" in a very extensive and meticulous manner, especially for research purposes. It is becoming increasingly evident that human brains/subjects, symptomatic or not for neurological/psychiatric disorders, can accumulate multiple brain pathologies (so-called co-occurring pathologies) during aging23,24. Intriguingly, these co-occurring brain lesions are biochemically identical to those found in patients with clinically manifested diseases and are localized in the same anatomical regions as well (PARS, ARTAG, CARTS)25-27. These more recent findings (possible only through autopsy investigations) have an extraordinary relevance to the study of aging effects on the human brain. Table 2 and Figure 4 describe some preliminary semiquantitative data obtained using a symmetric bi-hemispheric brain cutting procedure performed on a series of human brains collected in our brain bank. These preliminary data show that most brains received as "normal" or "control" from older subjects were actually not only positive for βA-neuritic plaques and tau-neurofibrillary tangles (tau-NFT), as already known28-32, but also that the burdens of insoluble βA-neuritic plaques were higher in the left entorhinal cortex and hippocampus in comparison to the right entorhinal cortex and hippocampus of the same brain. Brains were assessed using CERAD33 and Braak staging34 systems, which respectively assess βA-neuritic plaques and tau-NFT. The observed left-hemisphere predilection for insoluble βA pathology was also present, although only as a trend, in most of the remaining regions of the left-hemisphere in comparison to the right hemisphere. The relevance of these preliminary bi-hemispheric finding is that the analyzed brains were all from a general-population autopsy cohort. All subjects were hospitalized, in fact, for non-neurological/psychiatric causes and died in different community general hospitals for non-neurological reasons. The fact that the analyzed brains were from a general-population autopsy cohort minimized selection biases possibly present when analyzing only brains from specialized neurological/dementia centers. See also the recommendation from NINDS6. Our findings are preliminary (4 out of 46 available "control" brains) and need confirmation at a much larger scale. However, these novel findings, if confirmed, suggest a possible phenomenon of a hemispheric predilection for the accumulation and progression of AD pathology, or βA pathology at least. Similar types of pathological hemispheric predilections could quite possibly be associated with each specific type of neuropsychiatric or neurodegenerative disorder. Furthermore, by combining symmetric bi-hemispheric brain cutting procedures with methods of precise cellular and lesion quantifications (i.e., unbiased stereology), it could be possible to measure the ratio of normal to pathological conditions, as well as the ratio of neuronal loss to restorative/neuroplasticity phenomena that might be present in humans in relation to a specific hemisphere and function. Intriguingly, although the hemispheric predilection for each major type of brain pathology (β-amyloid, tau, LB, TDP43, FUS, etc.) remains to be established, functional neuroimaging34, neuropsychological36, and microstructural anatomical analyses37,38 seem to be in line with our preliminary results. This reinforces the hypothesis of a possible hemispheric predilection for each different type of brain pathology and related disease. Figure 1. Preliminary Brain Assessment Before Bihemispheric Brain Cutting. This figure shows the various superficial aspects of a human brain after 2 weeks of fixation in 10% neutral-buffered formalin. In a clockwise sequence, the superior aspects of the brains (a, b) are followed by the observations at the base of the cerebrum, which include inspections of the cerebellum (c), brainstem and cranial nerves (d), and olfactory bulbs and tracts (e). Please click here to view a larger version of this figure. Figure 2. Bihemispheric Human Brain Cutting. Formalin-fixed human brain placed on a flat surface for eye inspection (a). The red line indicates the medial longitudinal fissure. Placement of the two cerebral hemispheres after a central cut through the medial longitudinal fissure (b). Please click here to view a larger version of this figure. Figure 3. Bihemispheric Brain Cutting Procedures. This figure shows some of the steps of the bihemispheric human brain cutting protocol. 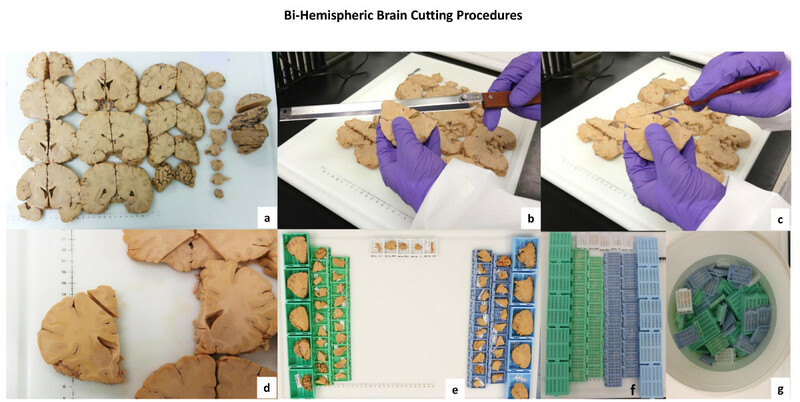 After disposing of all brain slabs (for both hemispheres) and following a fronto-occipital direction (a), each established brain region to collect (Table 1) will be cut in tissue blocks fitting standard histocassette dimensions (b - e). Cerebellum tissue blocks will need larger histocassettes (see the green [right cerebellar hemisphere] and blue [left cerebellar hemisphere]; e and f). White cassettes are for median structures, such as the medulla oblongata, spinal cord, etc. (e - g). The final histocassettes obtained after the bihemispheric human brain cutting protocol and containing brain tissue blocks from each neuroanatomical region listed in Table 1 are re-immersed in the same initial type of fixative solution (10% neutral-buffered formalin) (f - g). Please click here to view a larger version of this figure. Figure 4. Tissue Sections from each Cerebral Hemisphere Stained for Different Antigens by Immunohistochemistry. (A) This figure shows a series of tissue sections from both hemispheres of the same human brain. 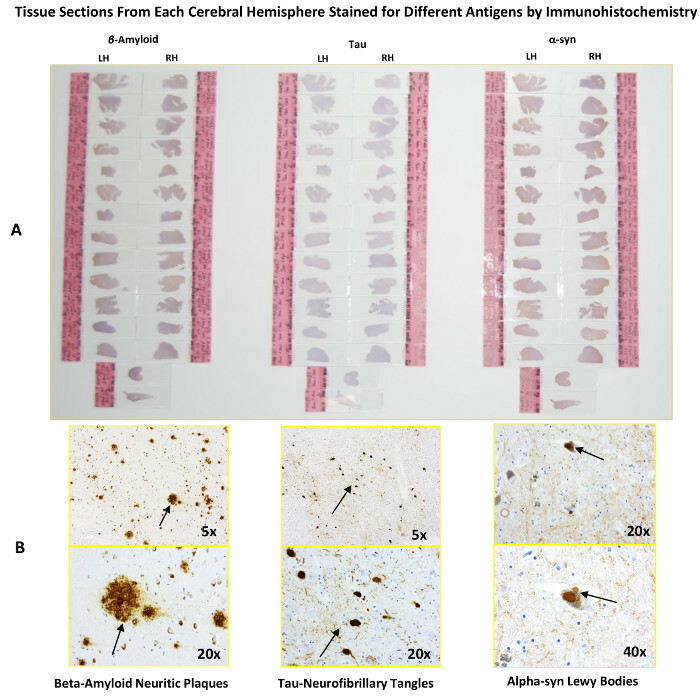 Each series of bi-hemispheric sections were immunostained for β-amyloid, phosphorylated-tau, and phosphorylated α-synuclein (α-syn), whose positivity is associated with common age-related neurodegenerative diseases such as Alzheimer's and Parkinson's. The image shows a representative example of the possible total amount of sections to analyze using the proposed bi-hemispheric symmetric brain cutting protocol. LH = Left Hemisphere, RH = Right Hemisphere. (B) These images show samples of common age-related brain lesions, as observed under the microscope after using specific immunohistochemistry protocols for β-amyloid neuritic plaques, tau-neurofibrillary tangles, and α-synuclein (α-syn)-positive Lewy bodies. In the inferior right corner of each image is the type of objective used (5X, 20X, and 40X) to magnify and accurately identify each type of lesion. Please click here to view a larger version of this figure. Table 1. Bihemispheric Cutting Scheme. This table shows the single anatomical area to dissect in both the left and right hemispheres of each brain. The bihemispheric symmetric cutting can be done on fresh and fixed brains. Please click here to download this file. Table 2. Preliminary Findings Obtained Through Bihemispheric Human Brain Cutting. This table shows preliminary findings obtained through a bihemispheric symmetric human brain cutting procedure performed on four human brains from clinically normal, older subjects. The data show that two cerebral regions (the entorhinal cortex and hippocampus) are constantly and early involved in the accumulation of β-amyloid neuritic plaques and tau-NFT. This type of lesion is considered to be the most probable pathogenetic process causing AD. f = female; m = male. The numbers between parentheses represent the age at death (in years) of each autopsied subject. A semi-quantitative colorimetric code for the quick visualization of possible hemispheric differences across types of lesions, levels of severity, and anatomical localizations among different older subjects has been used. Neg = negative (green); Sparse = 1 - 2 lesions (yellow); Moderate = 3 - 6 lesions (orange); Frequent = >6 lesions (red). Please click here to download this file. This brain cutting method can be adapted to the specific needs of each neuropathology lab (for example, by reducing the number of cerebral regions to assess for each hemisphere) while still retaining the bihemispheric symmetric cutting procedure as one of its main features. This proposed protocol could be used for routine procedures (research-oriented neuropathological centers) or only when necessary (specific clinically oriented studies). It can be selectively used only for specific types of investigations (i.e., immunohistochemistry) or molecular analyses (i.e., genomic or proteomic analyses). From a technical point of view, it is useful to mention that some pathological differences (especially in immunohistochemistry) could be due to possible artifactual variations in the immunohistostaining intensities. These can be minimized by utilizing automatic staining machines, which drastically reduce the possibility of artifactual staining effects and variations. It is currently possible, in fact, to technologically minimize most of confounding factors due to technical artifacts by using reliable robotic staining machines. Thus, comparable results can be obtained when assessing, for example, two cerebral hemispheres from the same subject, or multiple sets of both hemispheres from multiple subjects. Moreover, during the last few years, the number of brain lesions recognized in human brains has been enormously increased39. These new types of brain lesions created an increased risk that previous brains classified as normal or control are actually not. The improvement of immunohistochemistry techniques and new neuropathological discoveries would suggest a wise and periodic reassessment of all brains previously banked as "control," since cases of "pseudo-control" or "false-control" brains are always possible40. The main limitation of this method consists in the amount of time and expertise (anatomical and pathological knowledge) necessary to perform it. Moreover, studies aiming to analyze genomic and proteomic aspects of the human brain necessitate a brain bank team ready to manage, in a quick manner, all brain donation procedures, legal consent arrangements, brain removals, and immediate cutting for freezing or fixation procedures. Normally, these facilities and personnel are available only in specialized academic or research centers. In addition, while detailed cutting procedures can certainly help to better understand possible anatomical origins and spreading pathways of each brain disease, they will also always rely to the amount of detailed clinical information available for each case in order to perform accurate clinicopathological correlation studies. One of the best uses for this protocol, then, will be in the context of clinicopathological longitudinal studies, which are often the best type of investigation to collect more detailed clinical, imaging, genetic, environmental, and other types of data to correlate autopsy, microscopic, and immunohistochemistry findings with previously collected clinical data. Surprisingly, neuropathological investigations analyzing, classifying, or quantifying the wide spectrum of neuropathological lesions in relation to hemispheric function or localization are extremely rare41-44. However, it appears that times and technologies are ready for unprecedented challenges in human neuropathology studies. The main reason to propose a symmetric bi-hemispheric brain cutting procedure was to respect peculiar functional asymmetries (anatomical or pathological) of human brains. Too often, more for blindly accepted tradition than proven scientific reason, only one hemisphere (often stochastically selected) has been fixed for neuropathological or immunohistochemical assessment, while the other has been frozen for possible molecular or biochemical analyses. Especially when studying human brains, the casual selection of the hemisphere and consequent brain cutting contain potential risks in anatomical terms and may cause possible pathophysiological selection biases. While for practical reasons, fixing one hemisphere and freezing the opposite is reasonable in a non-research environment, it is not tenable any longer in the context of neuropathological research for neuropsychiatric disorders. Especially at the present time, when consistent amounts of "in vivo" neuroimaging and genetic information are potentially available at autopsy, a symmetric bi-hemispheric brain cutting procedure with a corresponding extensive neuropathological assessment should be performed routinely. The hemispheric specialization of the human brain has been demonstrated in many cognitive functions, such as language, dexterity, and emotions (i.e., differential activation in the left and right amygdala), to name a few. This hemispheric specialization and lateralization in higher cognitive and non-cognitive functions, which typically differentiate and characterize humans from other mammalian and non-mammalian species, must be carefully considered in terms of neuropathology. That there is, in humans, a hemispheric predilection for specific pathological processes in terms of neurodegeneration, neuroinflammatory response, and neuroreparative capacities is not yet known, and it has been very rarely investigated40-43. Although imaging supports well-known physiologically and clinically hemispheric-specific features, it is surprising how much less is known in terms of possible neuropathological differences. By proposing a symmetric bi-hemispheric brain cutting procedure, or the more sophisticated alternating frozen and fixed symmetric bi-hemispheric brain cutting protocol, we aimed to describe a method that could help to discover peculiar aspects of the human brain during healthy and pathological conditions, as based on its unique hemispheric specialization and lateralization features. One of the most critical steps of this protocol consists in the necessity of having the brain cutting setting, materials, and tools immediately available at any moment since it is very rare to be able to anticipate when a brain, in particular a fresh specimen, is arriving. Another important step of this protocol consists in the manual dexterity required for fresh and fixed brain cutting. Although dealing with an identical tissue, the two physical-chemical conditions (fresh and fixed tissue) make the acquisition of expertise for brain cutting an essential and critical component of the protocol. Moreover, neuroanatomical knowledge (especially for fresh brain procedures) supposes specific academic training periods. For fresh brain procedures, moreover, it is imperative and critical to move as quickly as possible and to maintain precision and the integrity of the tissue. This will preserve all biological information contained in the tissue, as well as the possibility to perform future investigations requiring fresh-frozen material (RNA, proteins, etc.). The double frozen and fixed symmetric brain cutting method represents the best possible compromise for obtaining both fresh-frozen (useful for genetic, molecular, and microdissection analyses) and fixed (useful for neuroanatomy, immunohistochemistry, and PCR in situ analyses) brain tissue sections from contiguous areas of specific cerebral regions and from both hemispheres. This methodology represents a source of comparative analyses obtained through different molecular and imaging techniques using exactly the same brain region/area (sub-anatomical region, gray matter nuclei, cell groups, dendritic/spines, etc.). A double frozen and fixed symmetric brain cutting procedure would allow one to obtain contiguous brain tissue sections from the same neuroanatomical area. This would allow for their analysis using bright-light, fluorescence, and electron microscopy (employing different procedures for each type of microscopy). RNA/DNA/protein extraction techniques could also be applied, through laser capture microdissections, for example, to the exact same region or group of neurons, cells, vessels, etc. This alternating frozen and fixed symmetric bihemispheric brain cutting technique, jointly with computerized systems for sample tracking and refrigeration, seems to offer enormous potential for the application of ongoing and potential future biomolecular studies. An alternative approach to the described brain cutting procedure could be the cross-sectional cutting of each entire hemispheric surface. However, this method requires more specialized and expensive tools (i.e., a larger microtome, larger slides, etc.) than the ones normally used in most neuropathology labs. Instead, our method proposes a more extensive collection of brain regions from both hemispheres, cutting those single cerebral regions using tools normally available (and affordable) in most research neuropathology labs. The proposed brain cutting can be combined with precise methods of histological, cellular, and subcellular quantification (i.e., for unbiased stereology)45-47. Quantitative neuropathological studies are of primary importance, and necessity, since quantitative data on circuits, nuclei, neurons, non-neuronal cells, vascular system abnormalities, and neuronal loss related to specific pathological lesions are mostly lacking in humans. Recently, precise quantifications of specific neuropathological lesions obtained by employing unbiased stereology protocols began to shed light on possible novel relationships between the accumulation of a specific intraneuronal lesion (i.e., Lewy bodies), neuronal loss (i.e., nigral loss), and clinical manifestations (i.e., parkinsonian symptoms) when analyzing human brains48. Determining the relative amounts of residual functioning neurons or reacting neuroglial cells necessary, for example, to contrast, delay, or compensate for specific neuropathological processes, could help to better understand the responsive and adaptive capacities of the adult human brain, specifically during aging. Volumetric neuronal changes, neurites, lesion loads, fiber lengths, cortical thickness, cortical layer thickness ratios, and other possible morphometric aspects are of special interest, since their probable pathophysiological relevance at the cellular and subcellular level in the context of neuropsychiatric diseases or neurodegenerative processes has not yet been completely elucidated49. Number, size, length of fibers or neurites, gray and white matter volumes and ratios, cortical layer analyses, etc. are all parameters precisely measurable thanks to the combination of specific statistical formulas and geometrical algorithms50. Geometrical equations and statistical formulas have been elegantly integrated with highly sensitive, computerized micrometric tridimensional coordination motorized systems (stereology motorized systems) for histological quantification of almost any type of bio-tissutal measurement. The set of neuroanalyses available now to study human brain tissues was not imaginable a few years ago, and it is highly probable that there will be further advancements in the near future. The detailed characterization of today's brains from patients, clinically asymptomatic subjects, and normal individuals will incredibly accelerate tomorrow's discoveries and the individuation of therapies for most neuropsychiatric and neurodegenerative diseases. In the context of complex illnesses, such as neuropsychiatric diseases, even the current sophisticated neuroimaging techniques cannot offer the higher levels of cellular definition and biological information that modern neuropathological techniques can. In addition, only static brain tissue images offer the opportunity to perform unbiased quantitative studies on a single group of neuronal cells or lesions or the possibility to cut single neurons (i.e., laser microdissection) to extract genetic or protein materials for mass spectroscopy analyses, for example51.The symmetric bihemispheric brain cutting methodology could be applied, among others, to special studies, such as those investigating identical twin brains. In this unique experimentum naturae situation, the potential to better understand the possible relationships existing between hemispheric specialization/lateralization and cognition/pathology is impressive. The different levels of hemispheric-related pathological symmetry/asymmetry could be more easily explained in terms of a nature/nurture dilemma. For example, a symmetric bi-hemispheric brain cutting procedure could be performed on the brains of identical twins versus fraternal twins52-56. A symmetric bihemispheric brain cutting technique should also be applied to human neurodevelopmental studies57. Highly informative data could be collected for specific aspects of hemispheric-related neuronal and glial maturation timing, developmental neuroplasticity phenomena, and neuroreparative capacities of the central nervous system during infancy and childhood. A symmetric bi-hemispheric brain cutting procedure could greatly contribute to better define the nature/nurture dilemma for personality trait formation and behavioral changes during normal development, normal aging, and as part of initial clinical manifestations of "sporadic" neurodegenerative processes58. The classical clinicopathological approach performed through structured brain cutting procedures is not a historical technique, but it is still a valid and useful tool of diagnosis and research. Especially at the current time, when impressive amounts of clinical and biological information are potentially available at autopsy, the combination of clinically well-characterized cases, neuroimaging data, and genetic/molecular information with detailed modern neuropathological/quantitative analyses could represent an unprecedented "right-match" in the history of neuroscience. Combined antemortem and postmortem investigations can enormously clarify the functional and neuronal/tissutal bases of neuropsychiatric illnesses and shed light on the exact etiopathogenetic mechanisms of these disorders, also taking in account possible hemispheric factors that were not specifically considered before. The authors are aware that the proposed symmetric bihemispheric brain cutting technique is time- and funding-consuming, but efforts similar to those performed for the advancement of neuroimaging should be done in the neuropathology research field as well. More harmonized and structured brain banking activities will not be more expensive than building or buying MRI machines, with potential scientific outcomes that would not be less rewarding than those obtained by neuroimaging studies. We thank the thousands of brain donors, patients, families, and neuroscientists around the world who, during the last two centuries and through their generous gifts and intellectual efforts, helped to discover how the human brain works, to understand devastating brain diseases, and to develop treatments thereof. We particularly thank Mrs. Cecilia V. Feltis for editing and reviewing this manuscript. Copy of signed informed consent allowing autopsy and brain donation for research use. Detailed clinical history of the subject which should include a detailed description of any neurologic and psychiatric symptoms and signs. Medical or nonmedical video-recordings when available (especially useful in movement disorders field). Next-of-kin’s consent required. Neuroimaging, neurophysiology, neuropsychiatric and assessment or clinicometric scales. Genetic and family history data. Genetic reports review, if neurogenetic diseases were diagnosed. Braun, B., Stadlober-Degwerth, M., Hajak, G., Klunemann, H. H. 100th anniversary of Perusini's second case: patient RM and his kindred. Am. J. Alzheimers Dis. Other Demen. 25, 189-192 (2010). Jellinger, K. A. Neuropathology of sporadic Parkinson's disease: evaluation and changes of concepts. Mov Disord. 27, 8-30 (2012). Head, M. W. Human prion diseases: molecular, cellular and population biology. Neuropathology. 33, 221-236 (2013). Hirano, A. Neuropathology of ALS: an overview. Neurology. 47, S63-S66 (1996). Oyanagi, K., Wada, M. Neuropathology of parkinsonism-dementia complex and amyotrophic lateral sclerosis of Guam: an update. J. Neurol. 246, (Suppl 2), 19-27 (1999). Montine, T. J., et al. Recommendations of the Alzheimer's disease-related dementias conference. Neurology. 83, 851-860 (2014). Procedures for Brain Autopsy in Prion Diseases. http://case.edu/med/pathology/centers/npdpsc/protocols-autopsy.html (2010). Yong-Hing, C. J., Obenaus, A., Stryker, R., Tong, K., Sarty, G. E. Magnetic resonance imaging and mathematical modeling of progressive formalin fixation of the human brain. Magn Reson Med. 54, 324-332 (2005). Love, S., Perry, A., Ironside, I., Budka, H. Greenfield's Neuropathology. Ninth Edition - Two Volume Set, CRC Press. (2015). Davis, R. L., Robertson, D. M. Textbook of Neuropathology. Third, Lippincott Williams and Wilkins. (1996). Dickson, D. W., et al. Neuropathological assessment of Parkinson's disease: refining the diagnostic criteria. Lancet Neurol. 8, (12), 1150-1157 (2009). Nieuwenhuys, R., Voogd, J., van Huijzen, C. The Human Central Nervous System: A Synopsis and Atlas. 4th, Springer. (2008). Netter, F. H. Atlas of Human Anatomy. Professional Edition, 6th Edition, Elsevier. (2005). Brown, R. W. Histologic Preparations: Common Problems and Their Solutions. CAP Press. Northfield, Illinois. (2009). Durrenberger, P. F., et al. Effects of antemortem and postmortem variables on human brain mRNA quality: a BrainNet Europe study. J. Neuropathol. Exp. Neurol. 69, 70-81 (2010). Hyman, B. T., et al. National Institute on Aging-Alzheimer's Association guidelines for the neuropathologic assessment of Alzheimer's disease. Alzheimers Dement. 8, 1-13 (2012). Gelb, D. J., Oliver, E., Gilman, S. Diagnostic criteria for Parkinson disease. Arch Neurol. 56, 33-39 (1999). McKeith, I. G., et al. Diagnosis and management of dementia with Lewy bodies: third report of the DLB Consortium. Neurology. 65, 1863-1872 (2005). Cairns, N. J., et al. Neuropathologic diagnostic and nosologic criteria for frontotemporal lobar degeneration: consensus of the Consortium for Frontotemporal Lobar Degeneration. Acta Neuropathol. 114, 5-22 (2007). Litvan, I., et al. Validity and reliability of the preliminary NINDS neuropathologic criteria for progressive supranuclear palsy and related disorders. J. Neuropathol. Exp. Neurol. 55, 97-105 (1996). Gilman, S., et al. Second consensus statement on the diagnosis of multiple system atrophy. Neurology. 71, 670-676 (2008). McKee, A. C., et al. The first NINDS/NIBIB consensus meeting to define neuropathological criteria for the diagnosis of chronic traumatic encephalopathy. Acta Neuropathol. 131, 75-86 (2016). Rahimi, J., Kovacs, G. G. Prevalence of mixed pathologies in the aging brain. Alzheimer's Res Ther. 6, 82 (2014). Jellinger, K. A., Attems, J. Challenges of multimorbidity of the aging brain: a critical update. J. Neural. Transm. (Vienna). 122, 505-521 (2015). Crary, J. F., et al. Primary age-related tauopathy (PART): a common pathology associated with human aging. Acta Neuropathol. 128, 755-766 (2014). Kovacs, G. G., et al. Aging-related tau astrogliopathy (ARTAG): harmonized evaluation strategy. Acta Neuropathol. 131, 87-102 (2016). Nelson, P. T., et al. 34;New Old Pathologies": AD, PART, and Cerebral Age-Related TDP-43 With Sclerosis (CARTS). J Neuropathol Exp Neurol. 75, (6), 82-98 (2016). Tomlinson, B. E., Blessed, G., Roth, M. Observations on the brains of non-demented old people. J. Neurol. Sci. 7, 331-356 (1968). Katzman, R., et al. Clinical, pathological, and neurochemical changes in dementia: A subgroup with preserved mental status and numerous neocortical plaques. Ann. Neurol. 23, 138-144 (1988). Crystal, H., et al. Clinicopathologic studies in dementia: Nondemented subjects with pathologically confirmed Alzheimer's disease. Neurology. 38, 1682-1687 (1988). Knopman, D. S., et al. Neuropathology of cognitively normal elderly. J. Neuropathol. Exp. Neurol. 62, 1087 (2003). Troncoso, J. C., et al. Neuropathology in controls and demented subjects from the Baltimore Longitudinal Study of Aging. Neurobiol. Aging. 17, 365-371 (1996). Mirra, S. S., et al. The Consortium to Establish a Registry for Alzheimer's Disease (CERAD). Part II. Standardization of the neuropathologic assessment of Alzheimer's disease. Neurology. 41, (4), 479-486 (1991). Frings, L., et al. Asymmetries of amyloid-β burden and neuronal dysfunction are positively correlated in Alzheimer's disease. Brain. 138, (Pt 10), 3089-3099 (2015). Leroy, F., et al. New human-specific brain landmark: the depth asymmetry of superior temporal sulcus. Proc. Natl. Acad. Sci. U S A. 112, (4), 1208-1213 (2015). Fink, M., et al. Lateralization of the serotonin-1A receptor distribution in language areas revealed by PET. Neuroimage. 45, (2), 598-605 (2009). Miller, A. K. H., Alston, R. L., Mountjoy, C. Q., Corsellis, J. A. N. Automated differential cell counting on a sector of the normal human hippocampus: the influence of age. Neuropathol. Appl. Neurobiol. 10, 123-142 (1984). Brettschneider, J., Del Tredici, K., Lee, V. M., Trojanowski, J. Q. Spreading of pathology in neurodegenerative diseases: a focus on human studies. Nat. Rev. Neurosci. 16, (2), 109-120 (2015). Nolan, M., Troakes, C., King, A., Bodi, I., Al-Sarraj, S. Control tissue in brain banking: the importance of thorough neuropathological assessment. J. Neural. Transm. (Vienna). 12, (2015). Wilcock, G. K., Esiri, M. M. Asymmetry of pathology in Alzheimer's disease. J. Neurol. Neurosurg. Psychiatry. 50, (10), 1384-1386 (1987). Janota, I., Mountjoy, C. Q. Asymmetry of pathology in Alzheimer's disease. J Neurol Neurosurg Psychiatry. 51, (7), 1011-1012 (1988). Stefanits, H., Budka, H., Kovacs, G. G. Asymmetry of neurodegenerative disease related pathologies: a cautionary note. Acta Neuropathol. 123, (3), 449-452 (2012). King, A., Bodi, I., Nolan, M., Troakes, C., Al-Sarraj, S. Assessment of the degree of asymmetry of pathological features in neurodegenerative diseases. What is the significance for brain banks? J Neural Transm. (Vienna). 122, (10), 1499-1508 (2015). Schmitz, C., Hof, P. R. Design-based stereology in neuroscience. Neuroscience. 130, 813-831 (2005). Kristiansen, S. L., Nyengaard, J. R. Digital stereology in neuropathology. APMIS. 120, 327-340 (2012). Erskine, D., Khundakar, A. A. Stereological approaches to dementia research using human brain tissue. J Chem Neuroanat. (2016). Lees, A. J. Unresolved issues relating to the shaking palsy on the celebration of James Parkinson's 250th birthday. Mov. Disord. 22, (Suppl 17), S327-S334 (2007). Iacono, D., et al. Parkinson disease and incidental Lewy body disease: Just a question of time? Neurology. 85, 1670-1679 (2015). Geuna, S., Herrera-Rincon, C. Update on stereology for light microscopy. Cell Tissue Res. 360, (1), 5-12 (2015). Drummond, E. S., Nayak, S., Ueberheide, B., Wisniewski, T. Proteomic analysis of neurons microdissected from formalin-fixed, paraffin-embedded Alzheimer's disease brain tissue. Sci. Rep. 5, 15456 (2015). Brickell, K. L., et al. Clinicopathological concordance and discordance in three monozygotic twin pairs with familial Alzheimer's disease. J. Neurol. Neurosurg. Psychiatry. 78, (10), 1050-1055 (2007). Xiromerisiou, G., et al. Identical twins with Leucine rich repeat kinase type 2 mutations discordant for Parkinson's disease. Mov. Disord. 27, (10), 1323 (2012). Iacono, D., et al. Neuropathologic assessment of dementia markers in identical and fraternal twins. Brain Pathol. 24, (4), 317-333 (2014). Iacono, D., et al. Same Ages, Same Genes: Same Brains, Same Pathologies? : Dementia Timings, Co-Occurring Brain Pathologies ApoE Genotypes in Identical and Fraternal Age-matched Twins at Autopsy. Alzheimer Dis. Assoc. Disord. (2015). Rentería, M. E. Cerebral asymmetry: a quantitative, multifactorial, and plastic brain phenotype. Twin Res. Hum. Genet. 15, (3), 401-413 (2012). Bishop, D. V. Cerebral asymmetry and language development: cause, correlate, or consequence? Science. 340, (6138), (2013). Mendez, M. F., et al. Observation of social behavior in frontotemporal dementia. Am. J. Alzheimers Dis. Other Demen. 29, (3), 215-221 (2014).